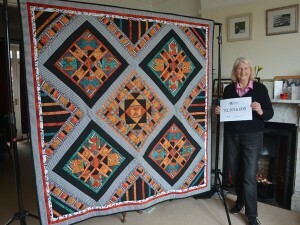 Judy made her ‘Colours of Africa’ quilt to help her get through a difficult time; the challenge and attention to detail that it demanded was a welcome distraction. 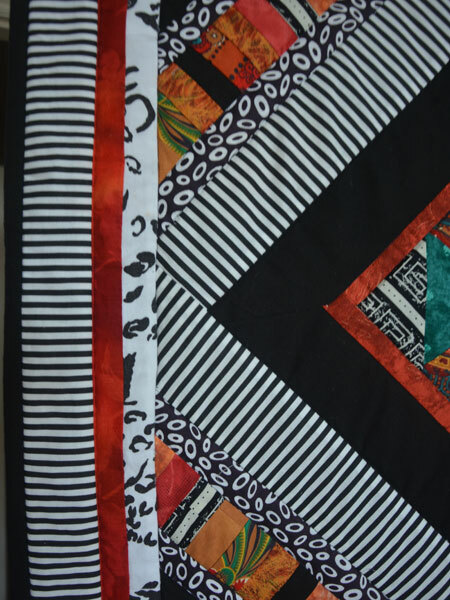 She talks about the process of designing and making the quilt, sourcing the fabrics and how the quilt is used. Later Judy discusses other quilt projects including wholecloth and a Baltimore Block quilt. 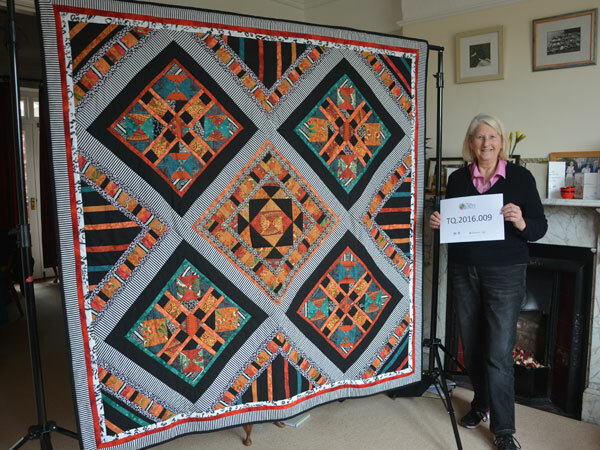 She also highlights some of the physical challenges of quiltmaking with arthritis and how she has adapted her quiltmaking to enable her to continue. Celia Jones [CJ]: This is Celia Jones interviewing Judy Steven in Lostwithiel on 5th December, 2016. Her ID number is TQ.2016.009 and we’re in Lostwithiel, Cornwall. So Judy, can you tell me about your lovely quilt here? Judy Steven [JS]: Well, the quilt was made during a time when I was quite fraught because my, [section of text removed for data protection] was uh, unwell with a breakdown and it really saved my sanity to have a project which I could immerse myself into and I used to go… this was in about 19… 1995 and I used to go to charity shops and collect together any cotton that I could find and I came across a dress there which was a cotton dress with all sorts of patterns over it and I just cut it up and made the quilt, which is quite geometric but it, it, it presented itself in the right way for the material that I bought and then I added to it. And so it is literally made from pieces that have come from charity shops and some pieces that a friend of mine gave me from a cotton skirt she had, and there are a few bought fat quarters, and the border, which is the striped border, that was bought as well. But most of it was all charity shop, so… but, but nowadays I think it would be more difficult to, to find things there like I did then. This is more difficult at that time nowadays to do that. CJ: And you said about losing yourself in it. How, how did, how, how do you mean? What do you mean by that? JS: Well, because it was, it was a design and I had, I had slightly geometric and I had to think about where I was going to put the… each piece had to be carefully assembled so that it would make a pattern and the colour, of course, you can lose yourself in colour and you, and you, you can picture in your mind all sorts of things which would be attached to that sort of colour necessarily. I mean, it could be, in this case it could be desert colours, because it’s that sort of colouring. But, you know, anything with, with colour or pattern you can lose yourself in with. CJ: Did you take the design from a book? 0:03:15 JS: I took the design from a book and in actual fact the book was a photograph and I had… it was quite a small photograph and I just measured, I just measured it very carefully and then just blew it up. I didn’t, I didn’t actually go and have it photocopied or anything. I just worked from the middle panel out and carefully decided, worked out as from the design, the design in the photograph how much width I would need for each piece because it’s, it’s all done in squares and I just worked it out from the photograph. I didn’t actually draw it up on craft paper or anything, but that, that’s how I did it at the time and it seemed, well, it seemed to work, but it was more luck than anything else. It’s not, not my strong point anything like that [laughs]. CJ: How did it help you through this difficult time Judy? JS: Well, it meant that it… because I’d decided to do this project and it was in a very difficult situation because [section of text removed for data protection] had a mental breakdown, but we were told that because [section of text removed for data protection] was an adult we couldn’t speak to anybody, which of course, was extremely frustrating because the only people looking after [them was] us and anyway, in the evenings when I was able to sort of, you know, be able to sit down, I would go upstairs and I would sit down and have to, and I, because I was working this pattern out from a photograph, I really had to concentrate extremely hard on what I was doing to get it all together, because… and so there wasn’t, wasn’t a chance that I was going to be able to think about how my [section of text removed for data protection] was getting or where [they were]. And that was the only way I could do it and it, it saved, it saved me, it really did and it was a marvellous project and, and I do feel too that anybody who has a problem, if they can find a project or something that they can immerse themselves in, even just for an hour or half an hour, you feel better about things. So, so that’s, that’s really what, what happened to me. CJ: Thank you. Can you tell us a little bit about your different fabrics on here then? You said about one from a friend. JS: Yes, well the, the fabric that I got from a friend was, not the stripey one, but the other black and white one and those came… they were two skirts and originally I had bought some fabric from a charity shop and I got it all into the, into the quilt and then, of course, when we came to stretch it and, and back it, it wouldn’t work because it had polyester in. So I had to take it all out again and as I say, I had two friends and they had two sep… two skirts… the, the one with the sort of rather white background and the other skirt… and I had to completely redo the whole of… all, all the borders I had to redo because the, the polyester stretches and it doesn’t work with cotton if, if you’ve got a pure cotton quilt in, in the first instance. And so I had to redo all that and, and that was just, just how it worked and it, and it… and after that I was able to put it together but, and the, and the only, and the only other fat quarters, the, the black I had to buy and the emerald green was a fat quarter and most of the rest of it, all the sort of um, um, desert colours, the, the sandy colours were from a dress that I found in a charity shop, which I cut up and, and that was how it all came together. But it was, it was quite a challenge because it was, each piece had to be… and there were a lot of little tiny pieces as well, which I had to put together. But, as I say, it was quite a challenge and it was, it, it, it, as I said, saved my sanity. CJ: Can you tell us what you used on the back? JS: … out of production, yes, and they were selling off a whole lot of materials and this material just fitted it. It was, it was exactly the right colouring, everything, and it was just luck. It was pure luck. I mean, I could have looked for a long time, but I didn’t have to because it, it… this company went out of production and it was ideal material. CJ: And what’s it got in the middle? JS: It’s got the polyester, usual wadding that people buy everywhere and it’s, and, and that’s what’s in between it. It’s… and it wash, it will wash. It will wash like a rag. CJ: How do you use the quilt now? JS: It sits on a bed and if it, if it’s sitting on a bed and I need to use the bed, it gets folded up and put in a trunk [laughs]. One day I shall give it to, [section of text removed for data protection] that was unwell, but [they need] to get a bit more settled [chuckles]. CJ: Thank you Judy. Can you tell us about how you started with quilting? JS: Well, I started with quilting… my mother was a quilter, but she never finished anything and so, and really at the time I was never terribly interested in it. But then when I sort of got the family [heads] that had grown up a little bit and I joined a group and I learnt to quilt and I just became quite fascinated by it. I thought it was a fascinating subject and so that’s how I started and various people who were very kind with all their knowledge passed it on and I was able to, to continue to learn to quilt properly and I did… I do not only just patchwork quilting, but also I learned how to do wholecloth quilting as well. JS: Yeah, wholecloth. Wholecloth is, is where you just have a pattern on a piece of calico and you stitch it through to the backing with wadding between, so it all is, is raised and so… and I took, I learned how to do that and learnt all the stitching and everything and that was from a group. CJ: Do you prefer using a machine or do you prefer hand quilting? JS: I prefer hand quilting but I can’t do it so much now. My… if one wants to talk about medical things, it’s arthritis and it, it gets into the arms. CJ: So you’re con… you’re continuing to quilt but using a machine now? JS: More often than not, yes, yes that’s right, yes. CJ: Do you have any idea why your mother didn’t finish the quilts that she started? JS: None at all. She just, she, she just didn’t seem to get them together somehow. But um, um, I don’t know, I don’t know. CJ: Do you have any of her pieces? JS: No, no. She, she, she got rid of the lot. When she, when she moved she just gave them away, but I didn’t, well I wasn’t given one, so that was it, which was a bit sad. CJ: Yes it is. How, how do you usually decide on your quilts? You’ve got such a range of quilts. How do you decide on your patterns and designs? JS: Well it’s got… I think in the first instance you, you sometimes you just see something and you think… I mean, it might be a, a collection of blues. I mean, recently I went to the American Museum and they had some reproduction, different blues which were used on quilts, American quilts, and I bought a pack of them. I thought, ‘Ah right, I think I would like to make a blue quilt.’ But it could equally well be something I might have seen in a, in a, in another quilting book and thought, ‘Mm, that’s a nice pattern or those are nice colours, and oh yes, I’ve got some material and that would look nice with that.’ So it depends on, on what grabs you really, you know, and, and, and when you want to use it. And, and sometimes I, I have things for five or six years and then I, and I never, I hardly ever forget what I’ve got, hardly ever. But you know, I can usually go upstairs and say and, and just look and think, ‘Oh yes, I’ve got some material that would be suitable.’ But you know, it is, it is just what, what grabs you at that moment. CJ: Do you ever think… do you ever make your quilt, your choices according to who you’re giving them to? Because I know you’ve given lots to family, haven’t you? JS: I’ve given lots to family but more often than not I don’t. They, they… and if they say, well, ‘We like it’, I say, ‘You can have it’, because I’ve found that if they’re too specific and then they’re given it, because they’ve asked for it and it’s not quite what they want, it’s more of a problem [laughs]. CJ: Which is your favourite of your quilts that you’ve made? JS: Now that is a very great problem that. I, I think really this, this quilt that I’ve made for my, when [section of text removed for data protection] was ill, is, is one of my favourites. But my other favourite really is my, my, what I call my wholecloth quilt, which was actually done in… each panel was separate. Each, each block was separate and then it was joined together but it made a wholecloth quilt and I enjoyed that. That was all hand done and I enjoyed that immensely. 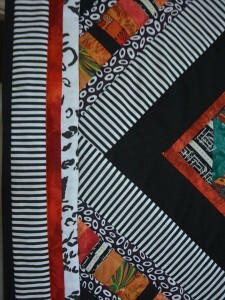 So, you know, they were two different, completely different types of quilt, but I enjoyed doing them both. CJ: How do you, you… how do you get your inspiration? You’ve mentioned in the past using landscapes? JS: Well, sometimes… if I’m looking at landscapes it’s, it’s sometimes, sometimes you can transpose landscapes, but sometimes it’s to do with, with the tones of colours and you think, ‘Oh, those, those tones go nicely together’, and you, you try and work out how it would, how it would work. But usually I try and find a pattern because I think it’s, you know, unless… I’m not… I, I think people who are very artistic can do landscapes, proper landscape type pictures, but I try and do patterns.. I’m much more interested in patterns and so… but the colours, it just depends on what’s inspired me. I mean, it could be a sunset or a sunrise and I think, ‘Oh, look at all those, those degrees of oranges and blues and yellows’, and, you know, and, and uh, quite often I’ll try and transpose something like that or use those colours. CJ: What do you look for in other people’s quilts Judy? JS: I’m not… well, I think skill is the first thing. I think you look to see the skill that they do. But I think quilting it’s, it’s a very personal thing and so although you might not like their colour or their design, you can go and look at their skill and the skill is really important. I mean, just, just… and also the way they have put materials together. 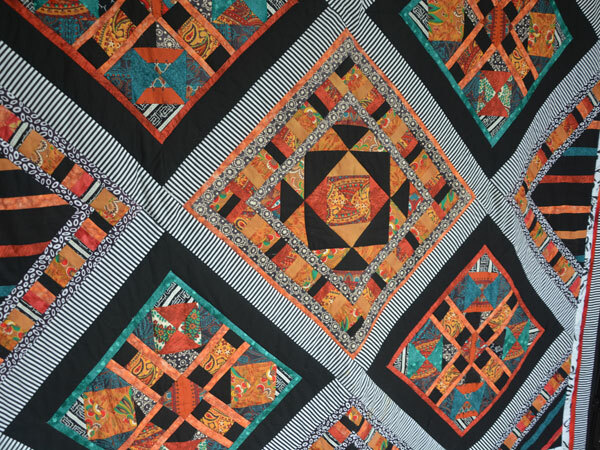 But, actual quilts, separate quilts, I, I… it’s such a personal thing and each person has a different way of looking at things, either through colour or design and, and you can’t be very specific about that really. CJ: So, do you like quilts that create a picture, as some of the more modern quilts, the exhibition quilts do or do you prefer patterns? JS: No. No, no, no. I, I prefer, I much prefer the traditional quilts. I mean, the nearest that I’ve ever got to with, with sort of pictures is, is a Baltimore quilt which I made and that’s the nearest I’ve got to a picture. CJ: Can you explain a Baltimore quilt to us please? JS: [Laughs] A Baltimore quilt is an American quilt and it’s done in blocks and every single block is different and it’s a picture and some of them have flowers, some of them have wreaths, some of them have birds, but each block is separate and you then join all the blocks and it’s quilted. But it, it, it is… off the top of my head I can’t tell you all the, the different… each block means something and I couldn’t possibly tell you what they all mean and all the different designs. CJ: Am I right in thinking they’ve got a strong colour sense? JS: They’re mostly red. They use a lot of red, a lot of red they use and so, so, so they’re very colourful quilts. But people used to do them in, in, in America with quilting bees and quilting bees were a group of women who would come together, particularly when it was the early days of the settlers and it was a way for women to come together and, and meet and they would make up these blocks and, and quite often they were marriage quilts, for, for a young girl’s trousseau. But they were all, all, all… many of them meant something, but, yeah and, and a lot of the designs are very traditional. CJ: You mention, you mention learning most of your quilting with a group. Is that with, with tutors or is it people within the group teaching you things? JS: Most of, of the learning I did was with people within the group. We did have some tutors for various, various things, but on the whole it was people within the group who were very knowledgeable and, and helped, helped you learn a lot. 0:20:17 CJ: Can you tell me about any difficulties you face quilting Judy? JS: Oh, difficulties? [laughs] Well, I think, I think for me the most difficult was to when you, when you finish doing your top, you then have to get it out onto the table and invariably it’s never quite straight and so you start chopping off bits and I have learnt over the years it is a complete disaster, because then it’s even more out of shape. So, so getting quilts together is really important and you have to be extremely careful to get it straight. But I, I suppose that’s not necessarily a difficulty, but it is a problem [laughs]. CJ: It sounds like difficult to me. I feel we ought to have a closer look at your touchstone quilt a minute. Can we go over there? So, it’s completely symmetrical then isn’t it? JS: Yes, it is. It’s completely symmetrical and this, the, the… each block… this is the only block that’s complete that’s different. That block. All the, the other four blocks are the same and this middle piece, these middle pieces, all this, this orange sort of dark, you know, sort of hot colours, they were all within this dress that I found and then I added the black and this was the skirt material a friend of mine gave me and that was a skirt material and all these other pieces, as you can see, all this was joined with little tiny pieces. All this here was joined and, and where I couldn’t fit things in… you see here, you can see a mis… a mistake. I added a little bit of black so that I could get the right shape for the triangle and, you know, it was, it was all tiny little pieces put together, but this emerald green was bought in a, as a fat quarter and I think, I think that was a fat quarter as well. It may not have been. I can’t remember now because it was quite a time ago I made it. CJ: Yes. You said 1995. Oh, you’ve got a label on it haven’t you? JS: Well, I think I have somewhere. Look on that corner. I had a label on it. I think it’s about 1995. It is 1995, I know that because I’ve got it written down upstairs. CJ: So it’s over 20 years old. JS: Yes, yes. It’s about 20 years old. CJ: And the back is stunning, isn’t it? JS: It was perfect because this company went out of production and this was it and, I mean, it was just made for the quilt, but it was lovely backing because it was lawn. It’s cotton lawn, the backing. CJ: Oh, that’s lovely Judy. Thank you. CJ: That’s about it I’m afraid. Sorry Judy, you started telling me about where you quilt. JS: Well, when I first started I, I started in one of the bedrooms. After family had left home I used one of the bedrooms to, to quilt and, and set my machine up. But then we moved house and we had an attic room and that is my den and that is for me to quilt. But I might say, it has, it does have two single beds in for our grandchildren, so it’s, it, it has to be flexible. CJ: Do you still feel that you lose yourself in quilting? JS: Yes I do. I do. If I, if I really decide on a particular project, I’ll, I’ll spend really too much time, because then I wonder why I’ve got a stiff neck and stiff arms. But I will spend hours and hours doing it, but it’s not… but, but, but, you know, it’s not a good idea. So I do try and not spend too much time at the, in the same position doing sewing or machining. CJ: So it’s good mentally but not physically? JS: Well, for this you, you need to just pace yourself. That’s the answer. If you pace yourself you’re fine, but otherwise it, it makes it more difficult. CJ: Can you just tell me about the quilting group that you go to now Judy? JS: Well, I only… I don’t actually go to a proper quilting group now, but I do go to a sewing group and, and I do take things with me if I’ve got a particular project going at, at, at the present time going. But, I don’t do so much now and I don’t make so many big quilts at all, because it’s too… they’re too heavy I find to get through machines and things I can’t manage it so well. CJ: Why do you like going to the sewing group? JS: I like going to the sewing group because you can exchange ideas, you all have the same interests and if you’ve got a problem you can always ask somebody and there’s usually somebody there who will be able to guide you in the right direction or, or give you a piece of thread that you might want or just something. And it’s just a very nice way of, of doing sewing as a, as a, you know, with a group. CJ: What do you think is the future of quilting? JS: Well, I think the future of quilting actually is, is, is pretty good. I think a lot of people love to do it. I think the real problem is that it’s expensive and cotton now, which we used to be able to buy at a reasonable price, is expensive and a lot of people, I think, would, would find it hard to, to find the cotton because in the charity shops now it’s, it’s difficult to find cotton. Cotton dresses are not cotton dresses. They’re polyester and cotton and they don’t really make good quilts because they stretch. But, I, I think people are interested, still interested, because a, a lot of the groups are full and a lot of the groups have waiting lists. So I don’t think there’s any, any lack of people wanting to sew and wanting to, to, to make quilts and things, but, but I think people are diversifying more and making other things other than just quilts. CJ: Can you tell me about passing on your skills, because you’ve got an immense knowledge? JS: Well, when I, when I pass on skills, skills I think it’s, I would do it within the group, or, or if somebody asked me I, I would obviously, you know, be able to tell them what I know. But I think it would be, it would be within the group that I would be able to pass on things, because I haven’t got… I, I think one of the problems nowadays is a lot of young people they’re working and they haven’t the time to, to do sewing and quilting and it’s much more when people retire that they are able to do some of these skills and I think you, you would join a group if you were going to want to pass on things so that people would have learned from that. CJ: Thank you Judy. Judy, you’ve just said about selling the quilt. JS: Well, I, I wasn’t going to sell it, but I did show it at a show that, that we had in our local village and a, a, a gentleman came up to me and offered to buy it off of me and at the time I said, No I, I didn’t want to sell it’, and he said that he wanted to buy it for his wife’s and his, his Golden Wedding and I said, ‘No’ [laughs]. CJ: I’m sure you’re glad you said no. JS: In some ways I am, but in other ways it sits upstairs now and nobody really sees it and I sometimes think that you ought to, you ought to have quilts that give pleasure to lots of people and not just have them put away in trunks and not to be seen by people. CJ: I’m sure at some stage your [section of text removed for data protection] would love to have it. JS: Well, I think it would be a long time yet. [section of text removed for data protection] [laughs].